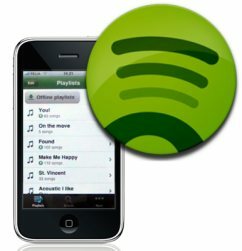 Home » Software » Spotify iPhone App Review – Is It Worth The Cost? When we covered the news of this app being submitted in our Spotify iPhone app preview, there was much excitement about it, to the point, a lot of people didn’t think it would be approved due to conflicts with Apple’s iTunes music store. However that has clearly not been the case, or perhaps they are fully aware of the Spotify app’s limitations and are happy to allow it to onto the iPhone platform, perhaps as means of testing the water for a potential iTunes music-streaming service of its own? First of all, I’m sure that Spotify will be getting lots of new premium members to their service in the weeks to come, as that is a requirement of being able to use the Spotify app – you can download the app for free, but need to be a paid-up premium member to use it, which means paying £10 per month. Now that’s quite a smart thing to do, no doubt they’ll get lots of new subscriptions this way, it even got me thinking of paying, however, £120 per year also got me thinking about how I use Spotify. Like I’ve already mentioned, I listen to music at my main desktop computer and then listen to my iPhone in the car, however, I listen to podcasts almost exclusively whilst driving or travelling by other means. Should I run out of podcasts, that’s when I then listen to some of my music in my iTunes library, those few occasions aren’t worth £10 per month to me, unfortunately. Therefore, given how I use it, perhaps if they’d gone the other way and charged a one-off fee (maybe something like £5 or £10) for the app itself and then still play adverts to non-premium members it would be better? What happens when the novelty wears off and people simply cancel their subscription, is Spotify just happy to get the initial cash injection? Or would they be better off overall charging for the app and have people listening to the ads on an ongoing basis? Or maybe it’s more a technical issue given the songs can be stored locally? Remember those limitations I spoke of earlier that Apple is all too aware? Specifically, the iPhone’s battery and the fact apps cannot run in the background. I know from using my iPhone, if you do anything for any length of time, it will be eating into your battery life, now I’m sure Apple has the iPod function optimised to help reduce power usage (I can run that for hours in the car, no problem), but how kind will the Spotify app? Well if you’re using wifi, then there’s the extra drain on power already and from early estimates from PC Pro, half an hour of streaming over 3G used up 25% of the battery, although if you’re running offline playlists, then that should be much better. Finally, the issue of apps not running in the background, this means that if when you’re listening to music with it, if you then want to check your email, twitter or write a text message, you have to exit the Spotify app, which means the end of your music listening, although it will resume from where it left off when you go back to the app. However, this is just not a problem if playing music from the iPod function on your iPhone, equally if you use the Spotify app for Android (also released today), it has no problem playing music in the background thanks to Android allowing this on their platform – is this another iPhone limitation that will eventually be Apple’s undoing? So there you have it, the Spotify iPhone app is an interesting proposition, although I can’t justify to myself the monthly cost to use it, I’m sure they’ll be lots of people out there who love to listen to their music on the move and this will suit them perfectly – if you’re one of them, please let us know what you think in the comments section below, what do you think to it? How fast does it drain your iPhone battery?